Why are you using our sidewalks?? A couple of days ago I was walking home from the bus stop. I was walking on the sidewalk, and I thought to myself, this is the safest place to walk, because no cars and other vehicles could pass through here, and it’s made for pedestrians. WELL HOW WRONG WAS I?? All off a sudden.. 3, 4, 5 motorcycles passed through me in relatively high speed from behind. 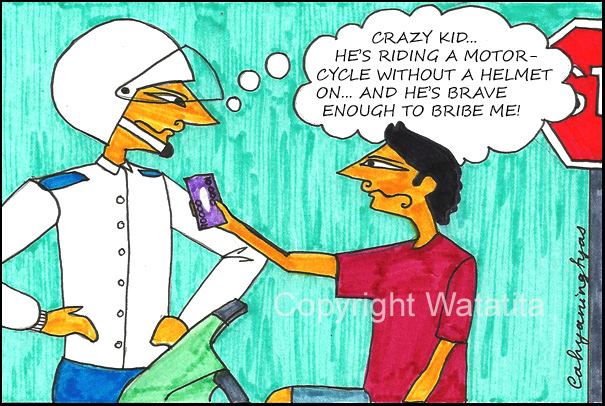 One of the riders shouted (without manners), “GET OUTTA THE WAY!!”. After that, around 10 more motorcycles passed through again. Ehm.. excuse me.. YOU’RE the one who’s supposed to get out of the way. This is a sidewalk, and it’s made for pedestrians! Look to your side, there is a BIIIG and LAAARGE road for you to ride your motorcycle on. I’m sure if I walked there, people in cars and motorcycles would be very annoyed. I also don’t like it when people park their motorcycles on the sidewalk. 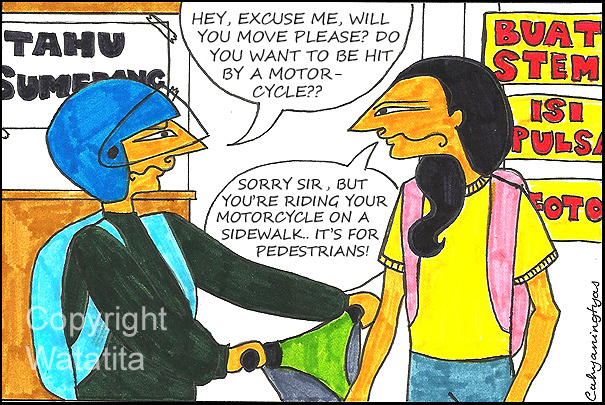 Maybe because there is no more place for them to park their motorcycles around, but it disturbs us pedestrians. It would be dangerous for us to make a circle and walk on the big road just because there is a mass of motorcycles parked on the sidewalk! We could get hit by a car.. 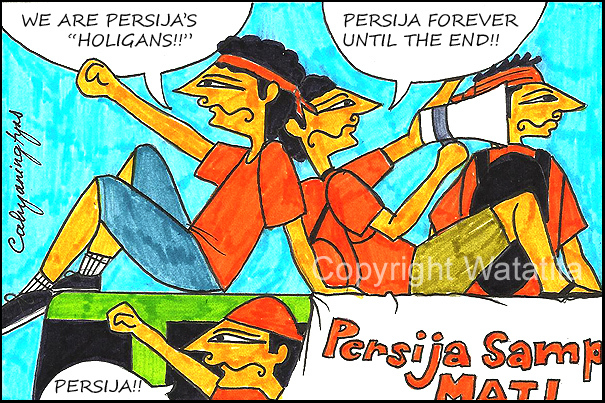 They Are Proud To Call Themselves Persija’s “HOLIGAN” – They Meant “Hooligans”. I am also a sports fan, even though I am a girl, but I loooove watching sports. So, I can understand sports fanaticism and obsession for the teams that we go for. However, around the world, football (or soccer) fans are known to be troublemakers (especially in big numbers!) because football/soccer is highly popular, and the fans love their teams like crazy, so when their team gets unlucky, the fans get very emotional. 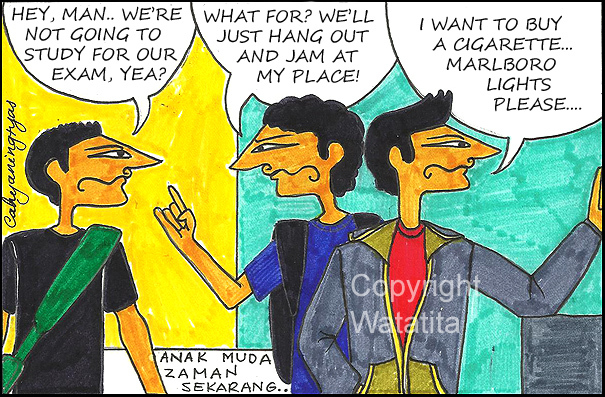 In Indonesia, the term ‘bonek’ (which is the abbreviation of ‘bondho nekat’ – the crazy fans of Persebaya – the Surabayan Footbal Club), is usually related to riots and trouble while watching football. In Jakarta, the football club here is called Persija (Persatuan Sepak Bola Indonesia Jakarta), and some of their fans proudly call themselves ‘HOLIGAN’… Ehm.. you mean Hooligan? I think it does come from the word Hooligan, just misspelled. Do they even know what ‘hooligan’ is?? A Hooligan is someone who is cruel, violent, troublemaker, brutal and aggressive. Usually crazy sports fans overseas who create trouble and causes riots, even deaths are called ‘hooligans’. They have to understand that ‘hooligans’ are the dumbest, no-mannered, no-class type of people. The “hooligan” status is not something they should be proud of. Maybe here, the term ‘holigan’ or ‘hooligan’ had been mistaken as ‘fans’. Unfortunately, these “holigans” acts exactly like hooligans. But it’s a good thing that their traits are now much better than how it used to be.. I hope their behaviours will improve, please keep your manners, and please be respectful. Today I was queuing in a shopping centre. In front of me was a bunch of teenage boys, approximately 13-15 year olds. They were singing a popular rock band song while air guitaring in the middle of the queue. They were queuing to buy… cigarettes. I could see from their attitudes that they thought that they were so cool. I was watching the girl behind the counter, her face indicated that she was dying to burst out laughing. Those boys were actually quite amusing, but they didn’t know how funny they actually were – because they thought they were so awesome. I wonder if their parents are aware that their boys are smoking and singing songs with a lot of four letter words in it.. They copied movements, words, and attitudes from celebrities they see on popular Western television shows, because that’s their idea of ‘cool’. Yesterday I passed the space for security checks for cars in front of shopping malls and a bunch of teenage boys in the car opened the window and started screaming at the security guard “THERE’S A BOMB!! THERE’S A BOMB IN THIS CAR! !”… I’m sorry, but I don’t find that funny at all. I know it was just a joke (and life shouldn’t be taken too seriously), but that was a very inappropriate joke, especially during these times. They're human too, you know..
Often I walk into my friend’s houses and observe the way they speak to their housemaids. Some are very nice and polite to them, and there are some who are rude, bossy and aren’t very nice to them. Some people I know (who I thought are nice people) talk to their housemaids like they have no feelings! It’s even worse when housemaids get violently treated. Their bosses can be prosecuted and be put in jail because they have gone against the human rights law. Even speaking crudely, humiliating them and other verbal abuse is supposed to be illegal. 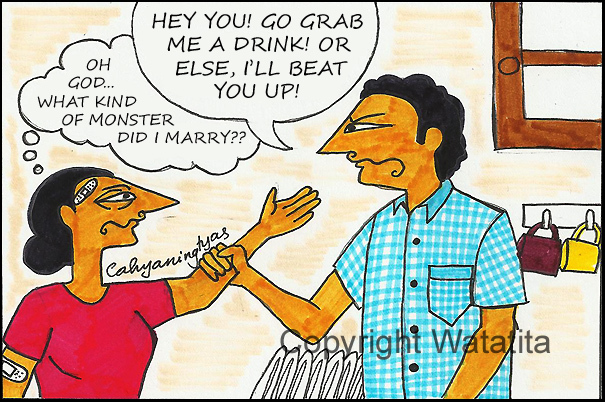 It affects the housemaids mentally or psychologically. One of the housemaids in my house used to shake and tremble when my mother called her, so my mother told her to calm down. However, she then told her that she used to be violently abused as a child, both by her own stepparents and her former boss. Her life was so hard, but now she’s much happier working in our household. 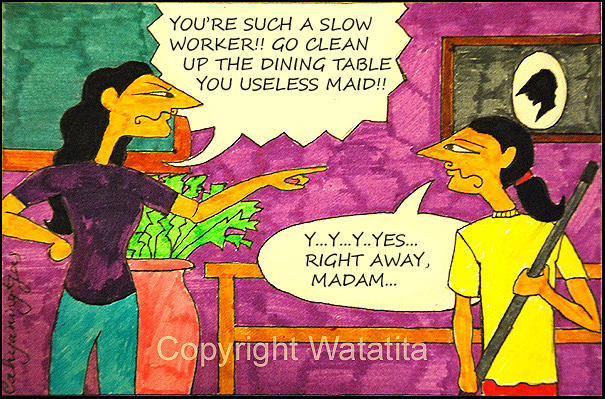 Housemaids, like all of us, are human beings too. They have feelings, they run out of energy, they can feel hurt, they can feel physical pain, they can feel tired, they also need enough rest and food. Talk to them like you would talk to your own friends, there’s nothing wrong with telling them stories, or joking them. Even though in human’s eyes they are in a different ‘status’ to us, in God’s eyes we are all the same. On public transport, such as a train or a bus, all seats are often taken when the transport is full, especially during peak hour. Not everybody on public transport is perfectly healthy or capable of standing up. I often see an elderly person getting into packed public transport, and nobody is nice enough to give up their seat for them. They pretend not to see him/her, so this poor elderly person is forced to stand up, when everyone else around them is healthier and physically stronger. Not only elderly people, but pregnant women and disabled people should be prioritised to get a seat on public transport. Please don’t just think about yourself when you’re using public transport. It’s called PUBLIC transport because it’s owned by all of us, it’s for us to share. 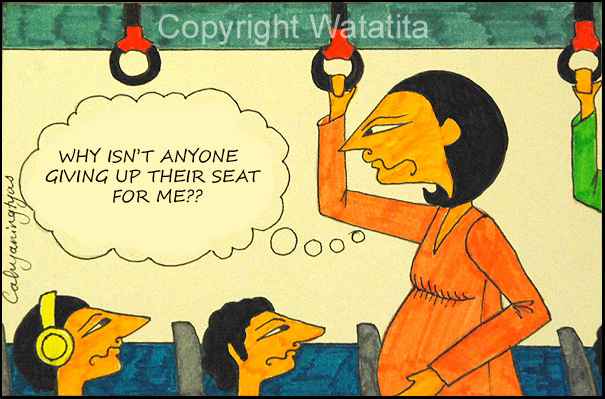 When there is someone who needs a seat more than you please give up your seat to them. I gave a seat to this old woman, she was so happy, and she talked to me through my journey home. Even though it was tiring to stand up, it also made me very happy that I did something kind.